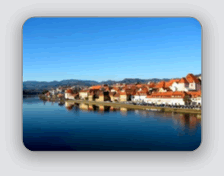 The company’s headquarters are located in Maribor, which is Slovenia’s second largest city. It is the political and economic center of Slovenian Styria, as well as the cultural, university, financial, administrative, educational and touristic center of the north-eastern region. Because of its location, Maribor is an important transport and transition waypoint, where major roads and rails from western, eastern and southern Europe meet. Around the world, Maribor is best known for its natural and cultural heritage (wine region, rich 800 year history, Festival Lent, …) and was a well-known industrial center. Many internationally renowned companies formed this lovely city at the Drava river into the leading industrial force of the Podravje region.